We planned on a short Cruise this month. Commitments and getting the Batteries upgraded cut the cruise down to a single week. 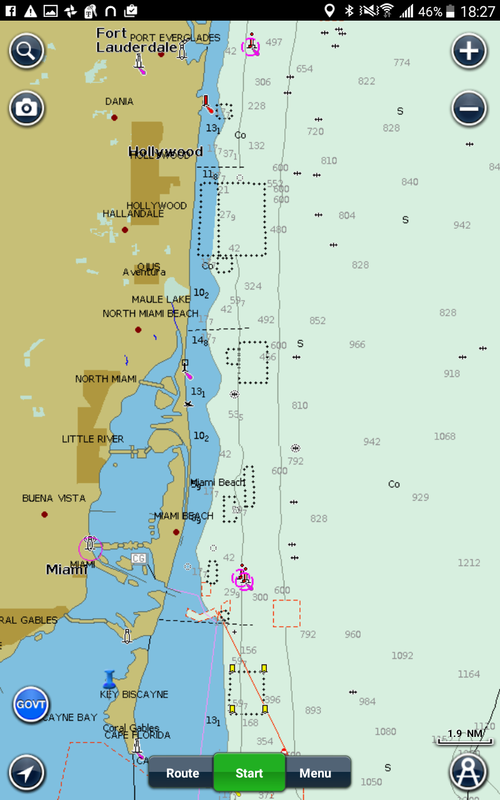 So we plan on just heading down to Miami and hanging out near Nixon's with some sailing in the North end of Biscayne Bay returning home on Friday. The Kids are keeping an eye on the house for us and our neighbors are always on the ball, so we keep them informed of our plans. The boat is ready: Sunday Night time to pick up a friend at the airport and fill up the spare diesel tanks just in case. So Monday all we have to do is head down to the boat load up the food, and cast off in time to get to the first bridge after 9:30 as they stay closed during the morning and evening rush hours. 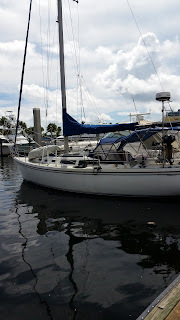 This will be our first decent sail in several month, so we're looking forward to the 53 mile journey down to Miami on Tuesday. The Wind is forecast to be from the East, ideal for that trip. We have our clothes packed, bedding is on the boat, the only thing to do on the boat is top up the aft Fresh Water tank - 10 mins max. Here's our sailing area. The screenshot is from my Samsung Tablet running Navionics HD. 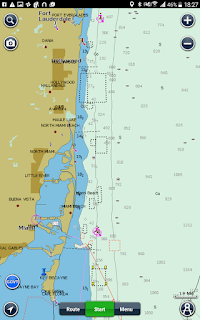 At the top is Port Everglades, we plan on heading out to the Ocean early Tuesday Morning after a night on Lake Sylvia. Here's looking towards a peaceful night so that we get our early start. Monday afternoon/evening will give us the chance to check that everything is secure for Sea. Weather forecast got it wrong!